Rugby Town will be looking to complete their unbeaten September this Saturday with a trip to Boldmere St Michaels in the newly-christened Total Motion Midland Football League. 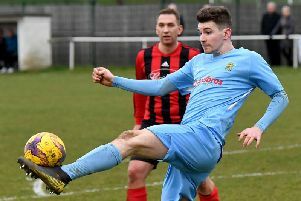 Last weekend’s 4-1 FA Vase victory at Smethwick continued Valley’s near-perfect month of six wins and a draw from their seven games so far, and hopes will be high in the Town camp that another win can be secured at the Sutton Coldfield located venue. The Vase success handed Town a First Round Proper tie at home to UCL Division One side Harrowby United on Saturday, October 21, and came thanks to strikes from Josh Ruff, David Kolodynski, Aiden Print and Ruben Wiggins-Thomas. Town have now racked up a total of 18 goals this month, with Kolodynski and Wiggins-Thomas neck and neck at the top of the season’s scoring charts with seven apiece and Ruff not far behind on five – with the midfielder continuing to prove deadly from set-pieces after another free-kick success at Smethwick. The fine form of keeper Lewis Gwilliams at the other end of the pitch continued at the weekend, and Rugby go into Saturday’s clash looking to extend a record of more than five and a half hours without having conceded in the league. The upcoming opponents have made a slow start to their MFL campaign with just one win in seven matches and are currently sat in 19th place in the Premier Division table. The two clubs have met each other four times previously in cup competitions over the years, with Valley enjoying a FA Vase win over the Mikes after a replay in 1981 and also coming out on top in two separate Birmingham FA affiliated competitions – the last of which coming in 1993 when goals from Andy Magill and Ashley Warner secured a 2-1 victory in its Senior Cup. Gwilliams’s form meant that first-choice keeper Niall Cooper’s return to fitness only saw him on the bench at Smethwick, and with Ben Ashby, Sam Belcher and the injured Harry Holloway all absent, there was a start in midfield for Craig Kelly. After Saturday’s trip, Town then enjoy a run of four matches at Butlin Road, with home league games against Coventry United and AFC Wulfrunians on October 7 and 14 respectively followed by the Vase visit of Harrowby and a League Cup clash with Coventry Copsewood on the 24th. # The Midland Football League announced that they had secured new sponsors this week with the commencement of a relationship with Leicester-based vehicle management company Total Motion.